Hundreds of books have been left on the streets of Manchester as part of a growing international swapping project. People who find the books in the city are encouraged to read them and then release them back "into the wild" for others to pick up, read and pass on. Known as Bookcrossing, the idea has already been introduced to the cities of Melbourne, Shanghai, Oslo, Montreal and Hong Kong. On Saturday, people in Manchester were asked to look out for books everywhere - from street corners to shopping arcades. The city's Urbis museum is behind the book exchange's introduction to the UK and visitors are being urged to bring their old books in to take part. 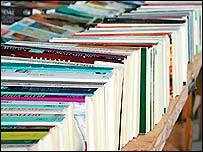 Didsbury's Oxfam Bookshop has donated more than 100 books to the project and Urbis staff have brought in their own books. Even the city's black cab drivers and First Northwest trains are carrying the books. The website also allows users to update the book's route and leave reviews before leaving it somewhere for other people to read. Bookcrossing founder Ron Hornbaker calls the movement the "karma of literature" designed to "make the whole world a library". Scott Burnham, Urbis creative director, said: "The beauty of Bookcrossing is that it's organic - this project will evolve and take on a life its own as books are passed on and on. "Bookcrossing is about animating the city of Manchester and giving everyone the opportunity to embark on a journey of discovery whether it's finding a book in a unique location, discovering its story or tracing the people who have read it before you." "Books have been left in parks, cafes and even telephone boxes"